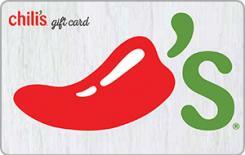 Earn 4.8 SB per $ when you buy ChiliÃ¢â‚¬â„¢sÃ‚Â® Grill & Bar gift cards at MyGiftCardsPlus, powered by Swagbucks. Chili's opened as a fun Dallas burger joint with a loyalty to happy hour and blue jeans. They pride themselves on their humble beginnings, following a devotion to great food, warm hospitality and community spirit. Today, with restaurants all over the world, they continue to cook up the best in casual fare, offering the same genuine service they did way back when. And, just as in 1975, they're committed to giving back to the communities that have helped them grow.